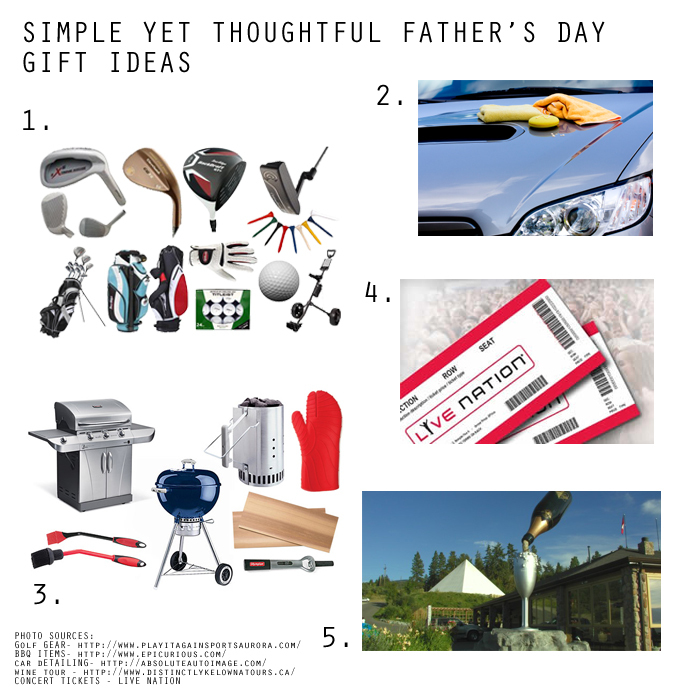 Father’s Day is less than two weeks away (Sunday, June 21), and if you’re like my sister and I, you’re still deciding on what to get Dad this year. Rather than just buy something fancy and expensive for him, I know my Dad would prefer something more meaningful that my sisters and I put thought into. He’s a simple and traditional guy who would rather us save the money for dinners, meals or practical around the house essentials. Golf gear ($$) Which golfing Dad wouldn’t love a new golf cart, bag, or accessories like gloves, hats, or a couple of nice golf tees. If you’re unsure of what type of golf gear he’d like, there’s always the option of a gift card to his favourite golf shop. Car detailing package ($) Regardless if your Dad is a car enthusiast or simply has a car to get him from A to B, he would appreciate a thorough cleaning of his car, both inside and out. Make sure you get a reference for the place first, before purchasing a package for your Dad. Ask your friends and see what their recommendations are so you can be confident the place will do a solid job on Dad’s car. BBQ equipment and/or accessories ($$) With summer quickly approaching (June 20), why not equip Dad with the essentials he’ll need to fire up the grill during BBQ season. Concert tickets for Dad and Mum ($$$) Even if the concert you’re purchasing tickets for isn’t until a few months away, it’s an event your parents will look forward to! Wine tour for Dad and Mum ($$$$) Another gift you’ll have to be prepared to pay more for, but in my opinion, so worth it to let your parents experience a wine tour where they will explore the vineyards and learn the process of how wine is made and how its flavours are created. This is especially a great gift idea if they are wine drinkers and appreciate it. Check out Groupon or Living Social for deals on any of these gift ideas. Chances are you will be able to find at least a few. Putting gifts and materialistic things aside, this Father’s Day, the most important thing to do is let your Dad know how much you love and appreciate him. Thank him for all that he’s done to support the family and for being there for you whenever you need. Make him feel even more special than usual! That’s what Father’s Day is really about.